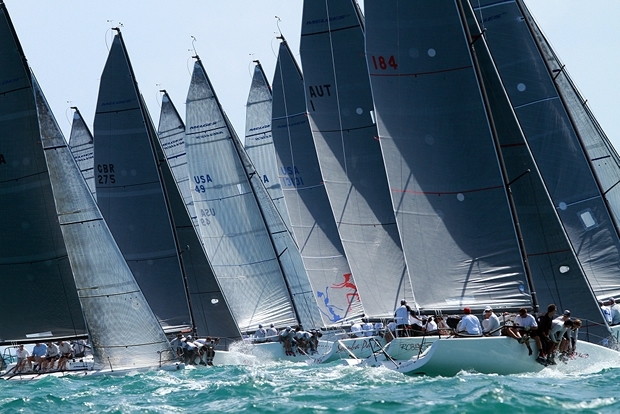 Alec Cutler and his Hedgehog crew of tactician Richard Clarke, crew members Max Skelley, Mike Wolfs, Eric Dorman, Charlie Pucciariello, Sarah Callahan and Alan 'Budda' Nakanishi have been crowned the Melges 32 2012 Miami Champions. Second overall is Full Throttle's John Porter with tactician Jonathan McKee alongside his 'boys' - Vincent, Corbett and Clifford Porter as well as Kelly McKenna assisted by Andy Burdick, and Fritz Lanzinger. Keisuke Suzuki aboard Swing rounded out the top three. It was decided early on Sunday morning to call off all racing as a fast approaching cold front surged ever closer, ushering in the potential for severe weather and high winds, some above and beyond class rule limitations. Saturday final results stand as is, for the final results on Sunday.